“Give yourself to the child until you have something on the page. Then let the adult critique.” That’s my new motto, and I painstakingly scrolled the words with my Mont Blanc pen upon pale blue copy paper decorated with a rainbow. I pinned the dictum above my computer in case I might forget the wise words of Judy Wilson, professor of creative writing at Southwest Minnesota State University (SWMS), the founder and editor of The Yellow Medicine Review: A Journal of Indigenous Literature, Art and Thought. On a recent weekend in Ortonville, Minnesota, she kept forty plus writers rapt, elated and emboldened at the Lakeside Writers Workshop, and I can only imagine the lucky students who enroll in her creative writing classes at SWMS. I’ve been rummaging through my notes, sorting through the gems of advice (and there were many), striving to retain the clarity and momentum of enthusiasm. But, it is within the above quote that I found my personal touchstone. Writers block must be the singular most debilitating hindrance to the craft. And for me it seems to arise more often, stay longer, strike deeper and do more damage than it did in the beginning of my writing life. No longer can I riff along on the keyboard, content with my cleverness and call it good. I can see now that previously my inner child tootled on, playing with words, having fun. Now the adult voice chastens, reciting the rules in my head, tsk-tsking that I’m liable to fall and bruise my self-confidence. The more I learn and the more skills I acquire, the greater my fear that I am not measuring up. That thought inevitably leads to a kind of paralysis, and I turn away and busy myself elsewhere. And the next thing I know, weeks have elapsed, and I am numb to my words. 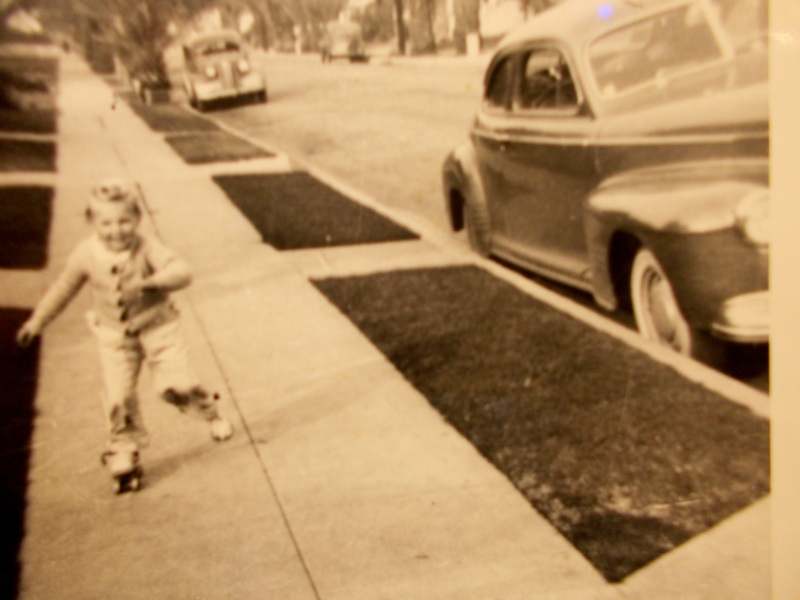 When I was perhaps five, I received a pair of roller skates. The kind with the leather strap that goes around your ankle and side clamps which were tightened with a skate key. No amount of scraped and bloodied knees, head bumps and shoulder twists could deter me from fearlessly flying down our sidewalk, ka-chum ka-chum over the lined pavement. And eventually I reveled in my magnificent (I thought) backward figure eights down the side alley. And even won a free admission pass or two for winning races at the local roller rink. My other childish passion was writing and starring in neighborhood backyard productions. I penciled the script on lined 8 X 10 paper, giving myself the starring roles, and audaciously sold tickets to all the parents, neighbors and local merchants. It didn’t occur to me that my enactment of “Dance Hall Girls of the West,” chosen specifically because I had recently received a Dale Evans cap gun, or what I believed to be a great knock-off of Betty Grable singing “It’s Only a Paper Moon,” was less than professional and not worthy of twenty-five cents. I never made it to the Oscars, but I did later star in a high school play and received applause upon my exit. Upon reflection, and thanks to Dr. Judy, I’ve decided to let Little Diane out to play. Big Diane and my writer’s group can pick up the pieces. This entry was posted in favorite things, IMAGINATION, memories, playtime, writing. Bookmark the permalink. How funny. I got some extra applause when I left a stage now and then, too. And relax. The people who paid five cents were probably thrilled that you had a little gumption.